1. There is a very direct way of taking a modo sub-d model, and turning it into a T-Spline mesh. Which means there’s a way to take that modo model turn it into a NURBS surface. So, models done in modo can be carried over into Rhino. 2. The toolset for sculpting and editing in modo is better developed than the toolset that Rhino has. modo has better edge creasing and falloff tools than Rhino. 3. I don’t know what the future holds for T-Splines for Rhino. Clearly, Autodesk is going to do something with T-Splines, but what that is I have no idea. Regardless of the the future of T-Splines for Rhino, I don’t think there will be any new tools or features in the near term for the T-Splines plugin – I believe that version 3.3 is going to be with us for quite some time. So, bringing modo into my workflow allows me to augment T-Splines for Rhino with a product that has a known future. 4. I really love the way modo models look. I’ve found that every platform has a certain feel to the way their models look, and modo is no different. The true test of a software isn’t how good it can look when the people at the absolute top of the pyramid use it – no, it’s how the models look in the hands of a competent, mid-level user. 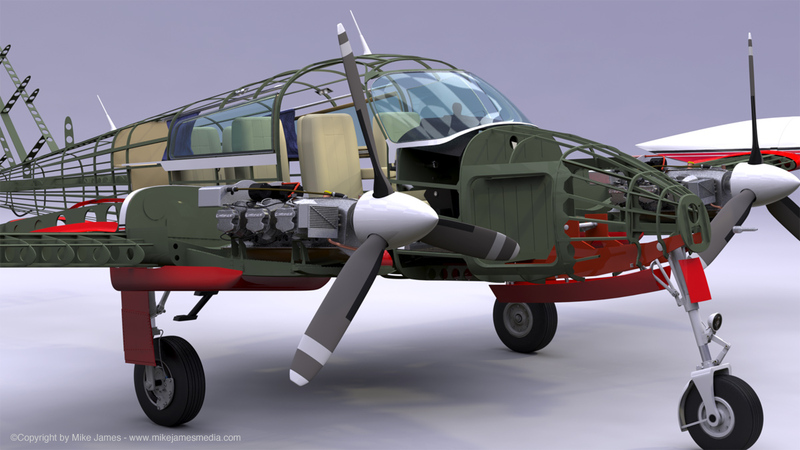 While most definitely not a “mid-level user,” the rendering of a Cessna 310 at the top of this post shows just what’s possible with modo in the hands of someone who really knows what they’re doing. 5. Learning modo allows me to see brand new workflows that can better inform my work in T-Splines for Rhino. When T-Splines for Rhino 3.3 added a tsBevel command, I didn’t think too much about it. But, after watching some modo training videos, I can see just how useful and powerful a bevel tool can be – it’s practically a bedrock tool in modo, and can be used in nearly the same way in T-Splines for Rhino. So far I’ve just been getting used to the modo UI and trying to figure out where everything is. I’m using a few online resources to help. First, I signed up for a one month membership to Lynda.com. There is an introductory video course available there that is 7 hours long (!!). Given that Lynda.com costs $25 per month, this is a fantastic value. Most of the focus is on understanding the tools and interface, which is just what I need right now. Another great site for learning is cadjunkie.com. Adam O’Hern runs cadjunkie, which offers training for modo, Solidworks, Catia and others. In fact, yours truly has just been tasked with doing a series of videos on reverse engineering, which will appear on cadjunkie. Look for those in a few months – they’ll cover hardware, software, setup and more. Adam is a top notch product designer, and so I’ll be using the modo courses on cadjunkie not only to get a better understanding of modo, but hopefully to also further my design and rendering skills. Lastly, the amazing rendering of a Cessna 310 at the top of this post is courtesy of Mike James, who runs Mike James Media. He not only offers his CAD skills to the world at large for hire, but also produces some DVDs on modo. I plan on getting his latest video where he goes through modeling the Cessna 310 and others. While Mike’s subjects are mostly aviation related, clearly his videos are useful to anyone looking to create extremely high quality models in modo, regardless of subject. Welcome to modo world, Schuyler! I think you’ll find modo quite intuitive, once you get used to the UI. It’s a beautiful, powerful piece of work, due to it’s modular nature. And… I know you’ll create some beautiful things with it. PS> Of course, a big Thank You, for posting my Cessna image, and for your gracious comments.